Tomorrow marks the start of Dementia Awareness week – a chance for us all to remind ourselves what this debilitating condition is all about, how it can be looked after and how the relatives and carers of those who suffer can also be helped. 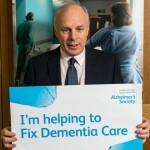 I am a keen supporter of the work of The Alzheimer’s Society which organises this annual event and does a great deal more in terms of providing practical assistance to the thousands of people affected. Meanwhile the search for any type of a cure goes on.